In April and May 1968, representatives of 84 States, 4 regional organizations, and 57 non-governmental organizations (NGOs) met in Tehran, Iran, for the first United Nations’ International Conference on Human Rights. It was going to be a highlight of the International Year of Human Rights, which was proclaimed on the occasion of the twentieth anniversary of the Universal Declaration of Human Rights (UDHR) by the General Assembly (GA). The aim of this national- and international-scale campaign was to raise human rights awareness on a global level. Nevertheless, the Tehran conference also became an important moment in itself and has, ever since, become a symbol of the ambivalent character of human rights in history. 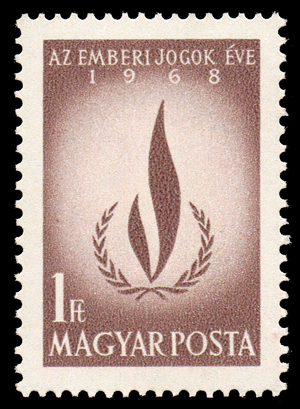 International Human Rights Year (Hungarian Stamp). By Darjac (Scanned by Darjac) [Public domain], via Wikimedia Commons. Even the choice of venue, the capital city of Iran, was indicative of the change that had taken place in the United Nations since the adoption of the UDHR in 1948. The number of UN member states had doubled since its inception. With the exception of the Security Council, the initial dominance of the organization by Western nations had broken away, due to the struggle of decolonization with a peak in 1960 and still going on. Debates on human rights were henceforth marked by the clash of colonialism and anti-colonialism. While Western states refused to take action in the field of human rights the decolonized States consolidated themselves in their fight against racism, Apartheid and the consequences of the Six-Day War in the Middle East. These issues thereby dominated the negotiations within the GA and the Economic and Social Council (ECOSOC). At the same time Jamaica took the lead and pushed their Idea of an International Year of Human Rights, and thereby a conference of human rights forward. In the end Tehran was selected for pragmatic reasons; the Shah offered space and funding, while most other states refused to contribute anything. At the same time, the Tehran conference was significant because of the changes that would take place in the following decades within the Global South. The Iranian monarch Mohammad Reza Shah Pahlavi, who had been re-installed in 1953 with the support of the CIA and MI5, ruled the country by brutal force. Aware of overwhelming domestic displeasure with his politics, he began in the 1960s to emphasize economic development and state modernization in his political manifesto, the so-called “White Revolution.” He established a “development dictatorship” in which political and civil rights were subordinated to the cause of modernization. During the late 1960s, this model became increasingly attractive among “developing countries,” of which two-thirds were not democracies. The West, especially the United States, perceived this approach as a reasonable alternative to communism and supported many of these anti-communist, authoritarian regimes, like South Africa, South Korea or Iran. The Soviet Union supported in turn the more or less Marxist or socialist regimes like Cuba, Egypt, or North Vietnam. And so it was that the patron state of the first International Conference on Human Rights was one in which basic human rights were suppressed. This pattern continued in the 1970s and contributed to the significant political decline of the UN during that decade. The year 1968 was marked by a complex dynamic of various events and processes in world politics that influenced the course and outcome of the conference. While the East-West conflict in Europe experienced a period of Détente, it collided in Vietnam with a wave of decolonization and unfolded its destructive potential. These events drove millions of people worldwide, but also in Western Europe and North America to the streets and induced a broad politicization in civil society. In Czechoslovakia, Alexander Dubček tried to reform the existing socialist system against the will of Moscow. Three weeks before the conference, the symbolic figure of the US Civil Rights Movement, Dr. Martin Luther King Jr. was assassinated. All this influenced the behavior of the participants and thereby the course of the conference. As a result of Détente the United States and the Soviet Union avoided direct attacks on each other. Czechoslovakia positioned itself contrary to their fraternal socialist countries by stressing civil and political rights. The United States dispatched the well-known civil rights activist Roy Wilkins as head of their delegation to Tehran. Wilkins then delivered a cautious and slightly self-critical statement. Because of their observers status, the NGOs who were present at the conference strived to gain any influence at the Conference but to no avail. The Afro-Asian countries highlighted their struggle against racism, apartheid, and the widening grip of Israel on the Middle East. At the same time, they demanded participation for the South in the results of economic development of the North. They thereby subordinated civil and political rights in favour of economic and social rights. Hence they repressed debates on human rights protection which many had strongly supported during the course of the struggle for independence. Only a few southern States like Jamaica, Afghanistan, and Haiti (the latter was ruled at that time by the dictator Jean-Claude “Papa Doc” Duvalier) deviated from this course, and stressed the implementation of human rights protection mechanisms. In addition to this concentration on collective rights and economic development, only a few other issues were included in the conference agenda. The most important resolution, which developed a lasting legacy and played an important role for the history of humanitarianism and human rights was the resolution on human rights in armed conflicts. It emphasized the importance of international humanitarian law and determined peace as a precondition to respect human rights. Another resolution referred to the dangers of technological progress, namely unrestricted surveillance technology, for the protection of human rights. The legal and social equality between men and women was addressed only in one resolution. The theme of family planning, however, was only related to the questions of overpopulation and thereby also dominated by the socio-economic development discourse. Just like the resolution on disarmament, which appealed on states to spend their money for development aid instead of the arms race. By the same token, specific references to individual rights can be found only in two short resolutions (Rights of Detained Persons and Legal Aid). On May 12th and 13th, 1968, the conference concluded with the adoption of 29 resolutions and one final declaration. Most of these resolutions dealt with the Apartheid, Israel, or economic development. The issue of implementation or even protection of human rights was left entirely unmentioned. The western response to the conference was very different. Most states showed little interest. The United Kingdom and the United States seemed pleased that no socialist and/or decolonized countries placed major accusations against them. The representatives of non-governmental organizations, however, were quite disappointed, as they desired a strengthening of human rights protection. For the NGOs, Tehran as host city clearly showed that the international protection of human rights could not be implemented by such a diverse group of nation states. In retrospect, the Tehran Conference cast a shadow over the real progress being made in the field of human rights. It continues to cast a negative light on a decade in which the foundations of the UN human rights protection system was laid with the two Human Rights Covenants (International Covenant on Civil and Political Rights and International Covenant on Economic, Social and Cultural Rights, both 1966), the International Convention on the Elimination of All Forms of Racial Discrimination (1965), and the ECOSOC resolutions 1235 (1967) and 1503 (1970). Tehran’s resolutions and its final declaration are considered as significant examples of the exploitation of human rights, cultural relativist criticism, and the dominance of the UN human rights bodies by non-democratic states from Afro-Asian countries with a cynical, even hostile, attitude toward human rights. Tehran marked a key situation typical of two significant elements in the history of human rights. First, the debates about human rights in the United Nations have by and large been shaped by decolonization and later by the struggle for equality between the “poor” South and the “rich” North. Second, the nation-states and therefore the United Nations were not well suited to accelerate the protection of human rights as a result of their divergent interests in the matter. Large-scale civic engagement during the 1970s built upon the influence of the Global South on the development of human rights in the 1960s, the culmination of which greatly contributed to the protection of human rights in the 21st century and to painting a more complex picture of a global process wherein the West was not always leading the rest. The 1968 International Conference on Human Rights has long been overlooked. Only a few historical studies of human rights mention it. Roland Burke, for example, examines the impact of decolonization on the development of human rights from the 1950s to the 1970s in his book Decolonization and the Evolution of Human Rights. For him, the Tehran Conference on Human Rights was a symbol of the broader changes taking place within the Third World. Democracy and individual rights were thereby subordinated to the pursuit of national development and cultural relativism, and became part of their political rhetoric. Steven Jensen on the other hand focuses on the role of Jamaica in the preparation and implementation of the International Year of Human Rights of 1968 in The Jamaican Broker. Tehran should have been the culmination of this extensive undertaking, according to Jensen, but turned out to be a disappointment. Despite this setback, Jensen shows that important legal foundations for the later development of human rights were laid in the 1960s by countries of the Global South. In contrast, for Samuel Moyn, Tehran embodies the symbolic failure of the idea of universal human rights in the 1960s because it was framed by nationalist thinking. This changed in the 1970s when the concept of universal and transnational human rights mobilized millions of people in Western countries, becoming what Moyn calls the “Last Utopia” of the 20th century. The UN offers a comprehensive online collection of various materials on the International Conference on Human Rights, including historical documents, photographs, and films. Burke, Roland. Decolonization and the Evolution of Human Rights (Philadelphia: University of Pennsylvania Press, 2010). Moyn, Samuel. The Last Utopia. Human Rights in History (Cambridge: Belknap Press of Harvard University Press, 2010). Jensen, Steven. ‘The Jamaican Broker: UN Diplomacy and the Transformation of International Human Rights, 1962-1968’. In Europe and the Americas: Transatlantic approaches to human rights, edited by Eva Maria Lassen and Erik André Andersen (Leiden: Brill Nijhoff, 2015): pp. 91-129. The Final Report, Resolutions, Speeches, Photos and Videos from the Conference can be found on the UN Homepage: http://legal.un.org/avl/ha/fatchr/fatchr.html. Peter Ridder is a PhD candidate at the University of Cologne. In his dissertation entitled “Human Rights Clash: The Struggle over the Protection of Human Rights in the United Nations, 1966–1993,” he investigates the impact of Cold War rivalry between eastern and western States in the United Nations on the development of the system to protect human rights during the years between 1966 and 1993. Peter was a participant of the Global Humanitarianism Research Academy (GHRA) 2015. Citation: Peter Ridder. ‘Tehran, 1968: International Conference on Human Rights’, in Online Atlas on the History of Humanitarianism and Human Rights, edited by Fabian Klose, Marc Palen, Johannes Paulmann, and Andrew Thompson, 2015-12, urn:nbn:de:0159-20160905122 [2019-04-26].